Can I let you in on a little secret? Your business skills are going to get you a whole lot further than any product knowledge you might possess. Something I learned very early in my business was the idea that it would be more important for me to see myself as an entrepreneur, and work hard at developing a solid business and brand than it would be for me to hang my hat on my in depth knowledge of a destination, certain way of travel, or all the ins and outs of booking various kinds of vacations. I’m not saying product knowledge isn’t important. It is. It’s just not going to be the only thing that makes you successful as a Travel Advisor in this day and age. In my first couple years of business I did not have the best product knowledge. Sure, I had personally traveled to a lot of countries around the world, but it wasn’t even leisure travel-- and it definitely wasn’t luxury! I would talk about luxury travel with confidence when my personal knowledge of anything luxury was severely lacking, and basically fake the funk when it came to the nuts and bolts of being a Travel Advisor. But guess what? Clients were still hiring me and trusting me to plan and create their dream trips. They paid me a planning fee because they trusted in the experience I would deliver for them, and because of how I positioned my business to be the answer to their problem. I was in the business of creating experiences for my clients and relieving a pain point in their lives. I could get help choosing the best overwater bungalow experience for them in Bora Bora, but I first needed them to know, like, and trust me -- and not just see me as a mini Expedia alternative. I see far too many Advisors spend their time, money, and resources on the nuts and bolts. They watch product webinar after product webinar, they go to conferences and meetings where they will be introduced to this supplier and that one, and they believe that their inexperience or lack of product knowledge is the problem. You need to be in the business of client attraction. What you need to learn more than the various room categories at each Sandals resort in the Caribbean is how to speak to the type of travelers you want to attract and build a solid business that creates an amazing experience for them so they can’t stop raving about you. There will never be a time and point in our business where we stop learning the nuts and bolts. One, because it’s an evolving and changing landscape, and two because we are professionals trying to be the best experts we can be. As we continue to grow our business, our knowledge will inevitably grow. I’m pretty sure you are wanting one of two things -- you want more clients, or you want a different echelon of clients. 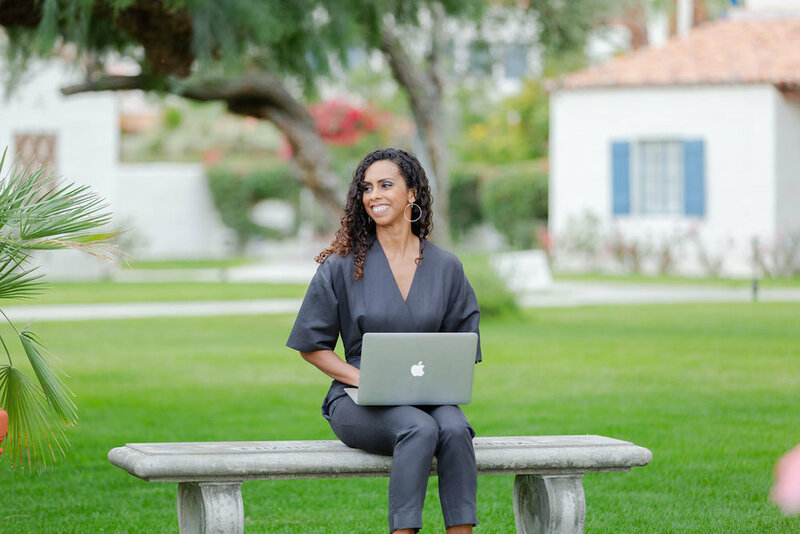 The best use of your time and energy is learning how to build a strong foundation for your business and doing the hard work to attract the right clients who can’t wait to work with you. An easy way to put this into action is by using social media effectively — If you are interested in learning more about how I can help you do that in the near future, pop in your email to be notified HERE! Social media is good for your business. It is legitimate free advertising. I capitalize on this all the time with my use of platforms like Instagram. If you don’t like free advertising, you can go ahead and skip this post, but if you think that your business could benefit from utilizing a form of marketing that can cost you absolutely nothing except the time it takes you to show up and share content, then keep reading. All that is required of you is doing a better job at putting out the type of content that allows your clients to connect with you and helps new clients find you and be attracted to your services. No other type of marketing or advertising allows you to get in front of your clients on a daily basis and engage with them like social media, and specifically Instagram. We are given a visual platform that people engage with on a daily basis — multiple times a day in fact. But here is what we have to remember— our clients aren’t on social media to be marketed and advertised to. Sure, it’s happening. But that isn’t what they logged on for. You understand that, it’s not what you log on for either! It’s our job to add value to their lives before then even become our clients. We are sharing who we are and what we do, from a perspective that actually helps them. That way they enjoy following us on social media, start to see us as the expert in our niche, and know all about how we can help them travel better. My advice? Approach your social media posting as if you were at a cocktail party. Think about it... if I was at a cocktail party I’d tell people who I was, I'd tell them about my business, and then we would probably find a few things we had in common we could continue discussing that would be of interest to the both of us. This could be hobbies, shared interests, the best new restaurant in town, etc. They might ask about my favorite destination (because doesn’t everyone always ask that?! ), and their ears would perk up if I shared anything they thought might be helpful to them. People always pay attention when it benefits them. The conversation would continue because we're talking about things that are of interest to them, and it’s a conversation they find valuable. Unfortunately there aren’t any cocktails involved. These conversations though are happening online through photos, videos, captions and the like, and the idea is the same. Social media is most successful when you realize what people are actually on the platforms for, and you begin to create and share content that furthers the conversation you are having with your followers. The posts that further the conversation and develop that know, like, trust factor? I call those strategic posts. In boxer terms those would be consider your jabs. Your right hook comes when you have obvious marketing posts. You ask for the business. You give away a freebie in exchange for an email address. You point them to your blog and ask them to engage with you off of the platform. These right hooks are most effective when they aren't the thing you are serving up post after post. If you find yourself struggling with what your strategic posts should be, here are some general themes and ideas to get your wheels turning. Remember: These are small snippets of information, but if people find it valuable they will pay attention! What are you sharing that is GIVING insight, information, and entertainment to your audience? Most of us have a hard time figuring out what that should be. I encourage you to think about your client. Really hone in on what they are struggling with, what they are worried about, what their pain points are in life right now and how you can help! The best place to start is by better understanding what our clients want to see from us and what they find valuable. I’m currently working on a step-by-step process to help you really take advantage of the free marketing that Instagram provides for your travel business. I want us to be able to approach this type of marketing without overwhelm and by using it to our benefit to grow our business and attract more of the clients we love working with. If you’d like to be one of the first notified, pop in your email HERE and I’ll be sure to keep you updated! As Travel Advisors one of the very best things we can do is share our own travel experiences -- whether it’s personal or professional (i.e. FAM trips). Nobody trusts a skinny pastry chef!! What I mean is this -- if you sell travel, it’s helpful for them to see you doing it in a way that inspires them and shows them that they can trust you with their own experiences. So not only is our own travel important, how we share it is equally important. We are far more effective if we show and don’t just tell. This is an opportunity to be a storyteller. Why is that important? Because facts tell and and stories sell. If you follow me on Instagram or Facebook, you know that right now I’m in South Africa. It’s a personal trip -- a trip that I’m taking for my one year anniversary and a destination that has been on my bucket list for many, many years. I’ve sold exactly one trip to South Africa, and before this trip I’ve never even been to this part of Africa. It makes sense that I haven’t gotten a lot of trip requests for luxury safari’s and South African adventures. But I want them! I know that this type of experience will speak to my ideal client. This is an opportunity for me to show her what an experience here is like, inspire her to consider it for her own similar travels, and position myself as the obvious person to help her bring it to life. I try as much as possible to be a storyteller when it comes to my personal travel. It is never about just posting a photo, or posting a blog telling you what I did while in a certain destination. I am painting a picture that hopefully you relate to on some level, that inspires you to take action and helps you see me as the guide to help you. *Show the experience through storytelling. *Position myself as the person to bring it to life. Pretty soon I want to share with you something I’ve been working on to help you learn to do the same thing -- this is what marketing on Instagram as a Travel Advisor looks like in the modern world, and I’m excited to share all that I know if you think it could help you too. Head HERE and pop in your email to be the first notified! I’m going to go out on a limb and try my hand at mind reading for a moment. I’m pretty sure you are wanting one of two things -- you want more clients, or you want a different echelon of clients. There is nothing better than working with clients who just get you. You’ve hopefully experienced a trip request that made you giddy with anticipation to start working on it, and the whole process was an absolute breeze because the client just got you, and totally trusted everything you did and was a breeze to worth with. I think every Travel Advisor wants more of that. But the question is how, right?! A strategy I have found to be highly effective is to first understand exactly who you want to work with, and then you figure out how to attract them in spaces on the web where they already are. To make this easy for you, I’m going to outline 3 specific strategies that help you do just that. In order for this to be effective, there are some things you really need to understand about your dream client because you are connecting with them on shared interests and hobbies. You don’t need to go and join a “Travelers who want to go to Hawaii” facebook group if you are a Hawaiian specialist. But if you are a Hawaiian specialist that loves to plan family vacations and you also happen to also be a mom yourself, well then joining a mom group on Facebook that is focused on whatever the heck mom groups focus on (I am not a mom so I don’t have a clue here) is a really great place to join a conversation. When I talk about starting online conversations, it is for the purpose of building relationships and to genuinely interact with your dream client. It’s not about selling to them. These conversations can happen in a myriad of ways -- from comments in Facebook groups or on Instagram posts or stories, to answering questions or giving helpful feedback any time you can. Ultimately you are building trust and engaging in meaningful conversations that will pay off in the long run. There are a ton of people in the online world who are trying to put out valuable content for their own audiences on a consistent basis, and many of their audiences contain people who are also your dream client. It is such a win to be able to have another business that basically validates what you do, but also shares your expertise and insight with their audience -- people you aren’t already in front of. Email editors of online travel focused magazines, podcasters who are either in the travel space or have a crossover in some way with clients you want to serve, or even travel bloggers. Find a story or something you can pitch to them that they may be interested in and that would serve their audience. If the idea of learning how to find more dream clients is appealing to you, I’d love to share a new project I’m working on. If you’d like to be one of the first to be notified, head HERE to find out more about The Marketing Roadmap.